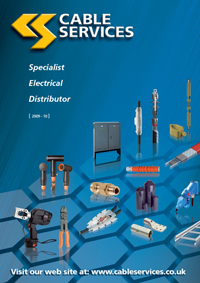 Cable Services distribute medium voltage cable termination products from the market leading manufactures: Tyco, 3M and Pfisterer and have over the years acquired a wide expertise in the installation of the whole range of medium voltage cable terminating. Tyco Electronics for single core polymeric, MIND paper insulated, armour wired paper or plastic, 3 cored paper and aluminium sheathed cable up to 42kV. 3M cold shrink one piece silicone rubber terminations and a wide range of termination accessories. Pfisterer CONNEX MV and HV Range for power cables 10kV to 52kV. Our vast experience coupled with stocks unequalled anywhere in the UK makes Cable Services the only choice for Medium Voltage Cable Termination products. We are distridutors and stockists of a wide range of termination accessories which are listed on our main website. This micro site is a resource for specific manufacturers information on the range of mv cable terminating we supply and provides in depth information and specifications. Terminations for polymeric and MIND paper insulated cables from 7.2kV up to 36kV. For polymeric cables up to 42kV. Heat shrinkable medium voltage terminations for indoor and outdoor applications. Set of 3 for up to 17.5kV. For up to 36kV. Pole mounted termination.